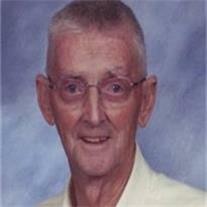 STRATTON, Gerald Robert (82) of Gilbert AZ returned to his Heavenly Father on Sunday, June 3, 2012. Gerald was born August 25, 1929 in Jackson, Michigan; he is survived by his 6 children; Douglas R. (Laurie D.), Sandra M. (Keith) Crandall, Cheryl L.(Mel) Jorgensen , Diane M. (Alan) Schultz, Dave A. (Kat) Stratton, Robert L. Stratton, 24 grandchildren, 25 great-grandchildren, a sister in law Donna Niewiadomski, a dear cousin Joan Waugh and many nieces and nephews. Mr. Stratton was a member of the Bella Vista Ward, Higley Stake of the church of Jesus Christ of Latter-Day-Saints. Gerald lived an active life playing sports, 9 years as a member of the National Guard, 7 years. as a stake missionary, 10 years as an ordinance worker in the Mesa Arizona Temple. He loved serving others and his career as an electrician. He was a loving husband, father, grandfather and friend.